If you've been to the Circleville Pumpkin Show and wondered what it takes to grow one of those monster pumpkins, here's a little bit of what goes into the process. If all things were equal, the one difference has to be the seeds. 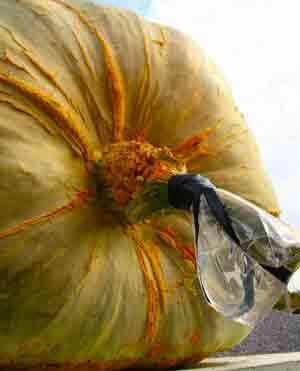 You just can't grow a giant from seeds coming from an ordinary sized pumpkin. There's several sources for giant pumpkin seeds, but they can be expensive (just check out the Ohio Valley Giant Pumpkin Growers). They have seeds that cost over $25 per seed! Perhaps the best place is the Circleville Pumpkin Show held in October. You can purchase a giant pumpkin seed kit (2 packages of identified seeds and instructions for $5.00). The plants that develop from whatever seed you select will be growing in your soil. The chemical makeup of that soil is absolutely critical for growing the giants. So before you even think about planting a seed, get a soil test. Ideally, this should be done in the fall or late summer of the year before you plan on planting. This will give you time, and your soil time, to be tested and amended long before actually planning. Soil testing is just a matter of taking a few soil samples from where you plan to grow your pumpkin patch, mixing the samples together and so you have a good average, and sending that sample to a soil testing facility and wait for the results. Once you get your soil test back you'll know what you have to do to the soil to make it the best possible soil for growing pumpkins. Always apply lime and fertilizers based on soil test recommendations. Providing adequate nutrients throughout the growing season will insure healthy, vigorous vines, not to mention large pumpkins. Granular fertilizers should be applied as a broadcast application over the soil surface and incorporated into the soil 4" - 6" deep a few days ahead of setting out your transplants. 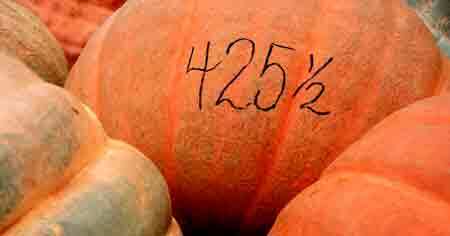 Giant pumpkin require about 2 pounds nitrogen, 3 pounds phosphorous and 6 pounds potash per 1,000 square feet of growing space. The addition of organic matter to the garden soil is important to establish good soil tilth and ideal growing conditions for your pumpkin patch. Growing giant pumpkins requires an early start. Seeds should be sown individually and started indoors in 12-inch peat pots about the end of April. A well balanced potting medium is recommended. Plants are ready for transplanting when the first true leaf is fully expanded. This is usually 10 - 14 days after seeding. Transplants can be protected from late spring frost using a floating row cover. Growing space in the garden is important. Each plant should be allowed approximately 2,500 square feet. This area may sound quite large, but it is essential for vine growth. Pumpkins prefer long hours of sunlight, so select your garden site accordingly. Avoid shaded areas and select an area with good surface and internal drainage. Pumpkins are shallow rooted, so water slowly with at least 1" of water per week if rainfall is not adequate. More water may be required during hot, windy summer days. Water during morning or early afternoon hours so foliage dries by evening. This helps prevent the spread of leaf diseases. Trickle irrigation is best, but soaker hoses also work well. Overhead sprinklers are effective; however, wet foliage increases the chance of disease, especially mildew. The planting site of your plants should be rotated each year to reduce the incidence of insect and disease pressure. Without a regular spray program for insects and diseases, your success rate for producing a giant pumpkin can be significantly reduced. An insect and disease control program must be initiated at transplanting. Insects are the primary vectors for transmitting viruses. Once a viral infection has occurred, there is no way to stop it. There are several pesticides recommended for insect and disease control. Check with your local Extension agent for current rates and compounds. You may refer to Ohio Vegetable Production Guide (Bulletin 672) for current pesticide recommendations. The licensed pesticide applicator will have more options regarding insecticides and fungicides available to them. Pruning is one way of forcing Mother Nature in putting all of her seeds in one basket-- or pumpkin! Begin pruning vines early in the growing season to put some control in what will in very short order, become an out-of-control pumpkin patch. Let side shoots get no longer than 8' long. Train these side shoots so they are perpendicular to the main vine. When pruning, bury the cut ends of the vine to help control moisture loss. Bees and flowers go hand-in-hand. In nature it is the bees and other insects that fly from one flower to the next carrying with them, the pollen. It is this cross pollination that creates the pumpkin. If you are after the really big pumpkins, you want to make sure that your female flowers are only pollinated with the right pollen. As you might expect, there are male flowers and female flowers. It is from the female flowers that the pumpkins grow. Identifying them is fairly easy: female flowers are attached to a large swollen base that roughly resembles a small pumpkin. With pumpkins, the male flowers appear first so they attract insects to help pollinate the female flowers that will follow. Having multiple vines growing will insure that you have both male and female flowers at the same time. It takes a little effort to ensure your female flower is only pollinated with the right pollen. As the pumpkin vines mature, they begin producing an abundance of flowers. With a little observation you'll be able to predict the day before a flower blooms. It is imperative that you protect those flowers (both the female and the male) from being pollinated by a bug. That means placing a plastic bag around the flower the night before you expect it to open. This will keep the bugs from beating you to the punch. On the day of conception, first locate your protected male flower and pick it. Peel off the blooms petals. Then take the male stamen (the parts exposed after removing the petals) and brush it across the female stigma. Once done, put the plastic bag back over the female flower. That will keep pollen carrying bugs from contaminating your efforts. Keep the bag over the flower until the flower begins to fade. Whether you want to grow your own great pumpkin, or just want a great-looking pumpkin to put on your front porch, you should know that Ohio has an entire team of pumpkin growers working for you.